Such an impressive and versatile rice dish. 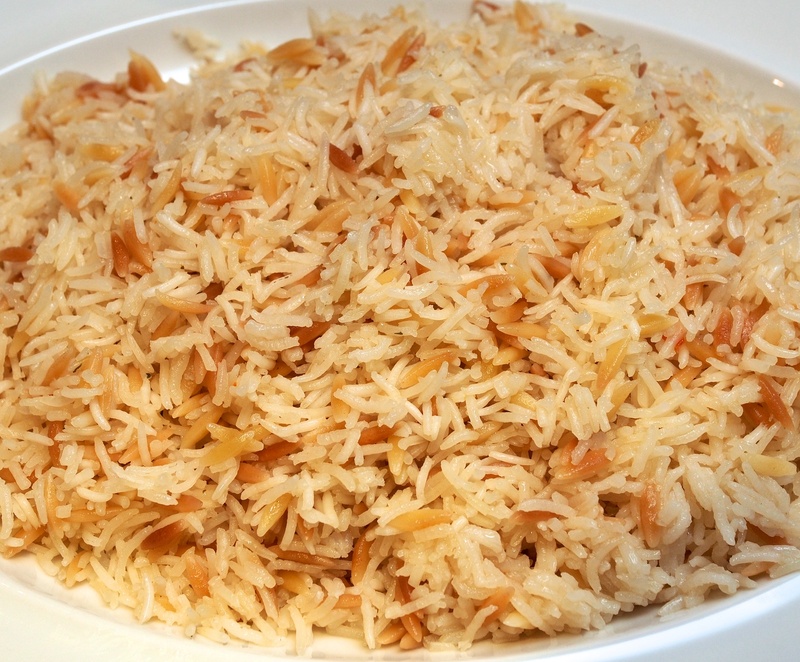 Great with Middle Eastern-style food or indeed anything you deem rice an appropriate side for. We served with these delicious meatballs. Wash the rice well, then put in a large bowl and cover with lots of cold water. Soak for 30 minutes, then drain. Heat the ghee or butter and oil on a medium-high heat in a medium heavy-based saucepan. Add the orzo and sauté for a few minutes, or until the grains turn dark golden. Add the stock, bring to the boil and cook for 3 minutes. Add the drained rice and salt, bring to a gentle boil, stir gently, then cover the pan and simmer on a very low heat for 15 minutes. Don’t lift the lid during this time! Take the rice off the heat, remove the lid and quickly cover with a clean tea towel. Put the lid back on over the towel and leave for 10 minutes. Fluff up with a fork before serving. A much needed bit of lightness in the midst of all the Christmas festivities. This is really nice and we got to use our new shallow casserole – not sure how we ever survived without one. 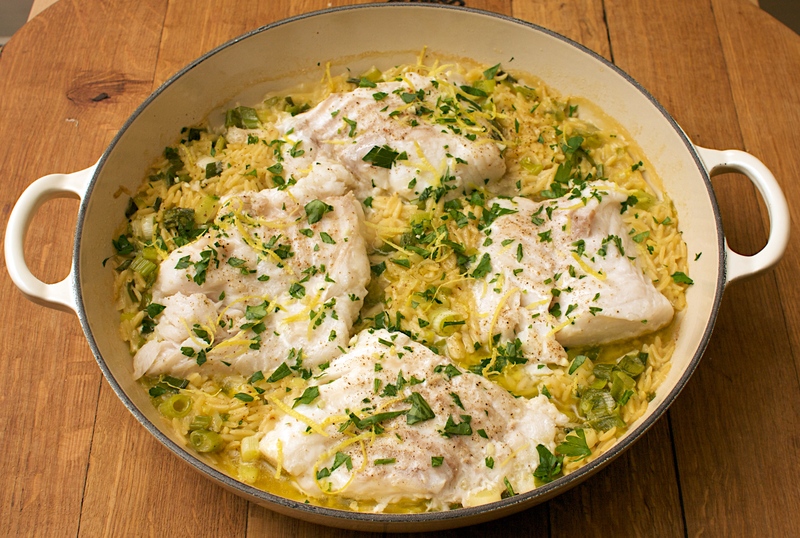 The fish steams lightly in the oven which keeps it really moist and you’ve much less chance of over-cooking. Heat the oven to 190C/fan 170C/gas 5. Heat the butter in a non-stick shallow oven-proof pan. Slowly cook the scallions until soft and then add the orzo and chicken stock. Simmer for a few minutes, until the orzo is almost cooked. Lay the fish on top, season, cover with a lid and put in the oven. 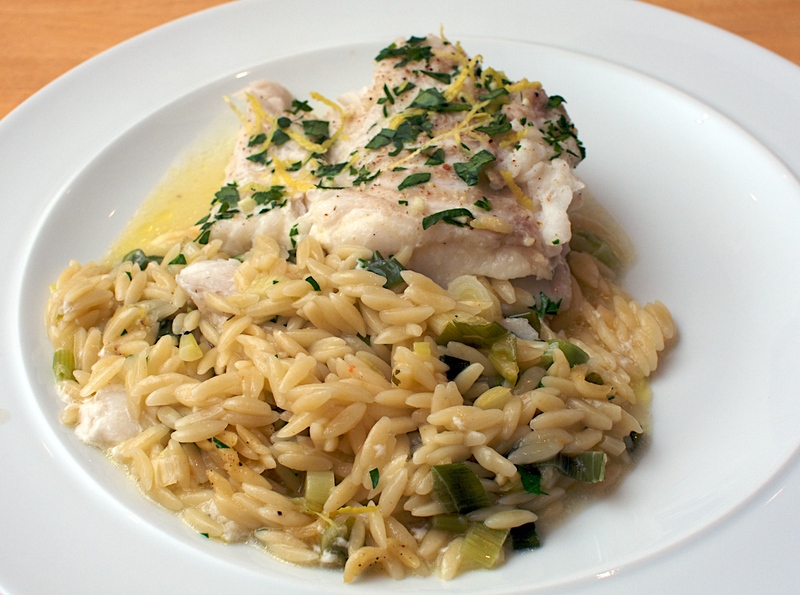 Cook for 15-20 minutes or until your fish is cooked through – it will flake easily when pushed with a fork. Mix the parsley, lemon and garlic and sprinkle over the top. Wine Suggestion: Go for something simple, light and lemony – like a Verdicchio or a light and dry Riesling. Nothing too complicated is required here.